Excellent all-round whitewater performance and being available in a wide range of sizes, makes the Dagger Axiom Whitewater kayak a great choice for beginners right through to advanced paddlers of all shapes, sizes and ages. The Dagger Axiom 8.0, 8.5, and 9.0 whitewater kayaks all have great down river speed and the combination of its long, sleek lines and soft-profile side walls, roomy bow and a slicey, reduced volume tail give it a playful, yet forgiving nature. 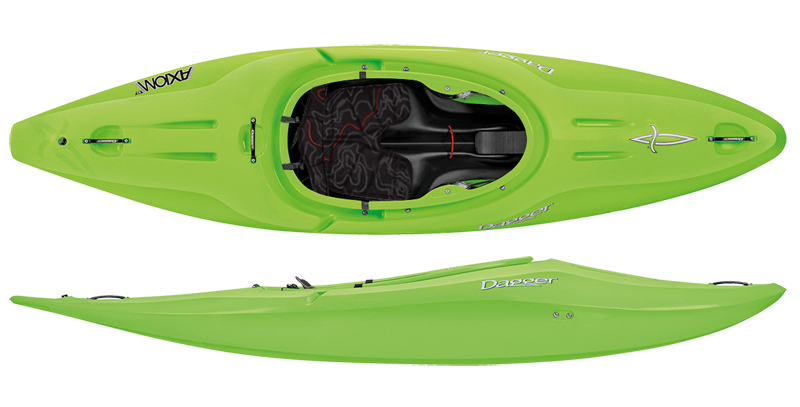 The Axiom whitewater kayak is available in 2 levels of outfitting. At the top end is Dagger’s brilliantly comfortable River outfitting, perfect for serious whitewater kayaking. It features an adjustable seat with removable booster wedge, precision adjustable thigh braces, ratchet adjustable backrest, multi-adjustable contoured hip pads and thigh brace padding, and outfitting kit including water bottle. For thise whoe don't need that level of specification, there is the Action spec outfitting which puts this great little kayak within more paddlers' budgets. All these features go together to create a great whitewater kayak with all-river performance and outstanding surfing ability. The Dagger Axiom is also available in 3 differnet sizes to ensure there is a perfect fit: at the larger end of the scale is the Axiom 9.0 which provides a comfortable fit for the bigger paddler while the Dagger Axiom 8.5 and Axiom 8.0 whitewater kayaks are ideal middle range options and for the smaller sized person. The Dagger Axiom is also avaliable in a 6.9 size. This is ideal for kids and smaller paddlers please click the link below to view more detials. Handy, compact throwline that are an ideal safety accessory for white water kayaking. Sold in single units, hard-wearing additional buoyancy bags for your new kayak. Essential safety kit for white water kayaking. These Colours are for picture purposes and may vary dependant on model. The Dagger Axiom is available for delivery thoughout England, Wales, Scotland, Northern Ireland & Ireland. The Dagger Axiom is available for instore collection from Norfolk Canoes or from any branch within the Canoe Shops Group.